Actually, I may have made this cake for a birthday, but I was trying to replicate the design of a Mother's Day cake pictured in one of my cake decorating books. It's one of the first cakes I covered in rolled fondant. I was living in the UK at the time and enrolled in a basic sugarcraft course, but I had only ever used buttercream or some other type of frosting to ice a cake, so this was totally new to me. Rolled fondant has since become very popular over here in the States, but it's not as readily available. When I made this cake nearly 14 years ago, I covered it with Regal-Ice, which I bought (comparatively cheaply) from the local grocery store. Here in the US, we have to either order off the internet or go to specialty cake decorating supply stores to get decent rolled fondant. I don't know if we'll ever see tubs of Satin Ice on the shelves at Publix. Anyway, for this cake, not only was I a rolled fondant beginner, but I obviously had no clue what I was doing with the piping either. I vaguely recall just kind of making it up as I went along. Not that there's anything wrong with that, but this is another picture that makes me cringe. However, I had a lot of fun decorating this cake, and I think I was at least minimally proud of it at the time, and that's ultimately what matters. Like with art, I believe it's more about the process than the product. Especially when you consider that unlike art, in cake decorating the product gets eaten. Oh, and I apologize for the poor picture quality. 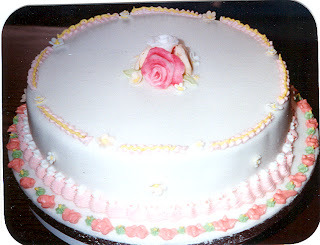 I made this cake long before I had a digital camera, so these are old fashioned, had-to-get-the-film-developed photos. At some point I thought them worthy to be included in my cake scrapbook, hence the awkward cropping. To post here, I had to use a scanner, and unfortunately, they came out a bit crooked and washed out. This Should've Done Sunday cake has a small cluster of hand molded sugarpaste roses in the center. They're brushed, rather ineptly, with petal dust for color. Along the sides of the cake are some blossoms I made using my plunger cutters, and they also divide sections of the top border. I'm not sure what I was thinking with that. I was apparently trying to so some sort of overpiping, but I have no clue why I chose those colors. It also looks as though the icing is too thin, or something. The bottom border is the result of me trying to make shells before I knew how to make shells. I then topped off the uneven mess with stars. There was some space left on the cake board, so I filled it in with blobs. I guess I didn't feel like it was really cake decorating unless I squeezed a lot of icing out of a bag. Just for comparison, here's what I was going for. Used only one or two colors. I don't know why there's such a mess of mismatched hues, unless I was struggling with matching the icing colors, which is why you always need to color enough icing to do the job. If you run out, trying to match that exact color is a nightmare. Left off the top border. You can't really tell in the picture, but the edge is crimped, and then there's a mess of piping on top of that. I'd still do the crimping, but that's all. The blossoms on the side are fine, but to make it look more like the cake from the book, I should've had more of them in a continuous swag. The bottom border needs to be smaller and simpler. Properly made shells or a bead border would work, but without the irregular and uneven row of stars on top. The weird pink blobs with green stars in between need to disappear. I think there were a few wrinkles in the fondant along the bottom of the cake, which is why I piped so much of a bottom border on it. Other than that, I'm happy with how I covered it. I just wish I hadn't made such a wreck out of decorating it. Still, as best as I can remember, it tasted good. That's the cool thing about cake. I doesn't have to be decorated at all, much less well, to taste good. I think it's always fun to look back in time at the beginning to see how far we have come... I agree about being so proud of something at that time, and now it makes you cringe!! I am sure even the best cakemakers even have that issue! !